Sharpen you up for a bit of the old ultra-violence. 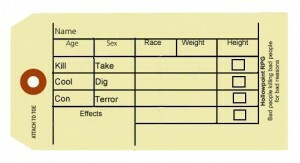 Any game with a toetag for a character sheet is going to come with certain expectations. The strapline is Bad People killing Bad People for Bad Reasons. You might think that this is a hyper-realistic gunfight simulation a la Phoenix Command. It’s not. 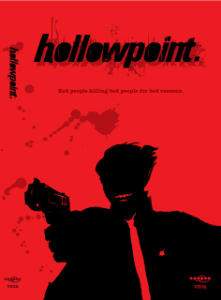 Hollowpoint is about three things: “hyper-capable people”, teams, and missions. Hyper-capable people are so advanced in their skill sets that normal humans don’t register to them, either as threats or collateral damage. The thing about these people is that they are the best–so sticking them in a team with other people who are also the best causes friction. Everyone has a different opinion on how to solve the mission, and those opinions cause tension. This game is all about the mission and the cool people who do that mission. Hobbies, personal plots, pithy conversation in diners and other activities that aren’t directly focused on the mission are irrelevent. The Mission is nothing more than a series of Conflicts which are resolved by dice and then backed up by narration from players and GM. To get Hollowpoint you have to understand that the Conflict isn’t about itemising actions, shooting individual antagonists, picking locks and so forth–it’s about the whole mission and the steps taken by the team to get to their objective. Everyone contributes dice based on the skills they are applying, and they all oppose the GM at the same time during the conflict. One PC may be seducing an enemy agent using CON skill, another may be hacking a mainframe from the cafe across the street with DIG, two more may be going through the hotel room by room and eliminating enemy resistance using their KILL skills. Everything happens at the same time. Dice are rolled (d6 dice pools, looking for matched sets), and depending on which side wins, hits are applied. About hits – agents and antagonists take 2 hits to be removed from a conflict (and if the antagonists are removed, that’s a victory for the PCs). No-one dies, even if they’ve taken two hits from a KILL roll and are bleeding out; an agent “moves on” entirely at the player’s discretion. Clearly the game has been designed to turn agents over quickly, and if a PC moves on (dies, leaves the job, etc) then a new agent replaces them. It should be noted that this is the only time the PCs may get new information or feedback from their agency–other than that, the initial mission briefing is all the PCs get and otherwise they’re on their own. It’s up to the players to be proactive, not reactive. Yes, there are retaliations where players will have to organise themselves as a response to a threat, but even these begin with the players declaring their own skills and if necessary, bidding for teamwork dice. Now, about teamwork. Hyper-competent people don’t usually ask for help from other hyper-competent people. If they do ask for help and the other player agrees, they give up all of their dice to the requestor. But they may say “No!” and if they do, they actually take dice from the character who’s asking. Asking for help is a sign of weakness, and being turned down actually makes you weaker. If that happens, the player who’s been declined may then take dice from the communal teamwork pool, but that’s a finite shared resource. Other features of the system include a FATE-like Traits that may be burned for extra dice immediately, and Escalation. As the mission proceeds, the GM Escalates her dice pool whenever the players win a conflict (or run away… hyper-competent people should be punished for running away). Escalation is just the addition of two extra dice to the GM’s base pool. Presentation-wise, the writing is top-notch. Murray takes a lot of care to establish the premise in the introductory section, using examples from heist fiction (Heat, Ocean’s 11), and provides a comprehensive section for the GM on how to structure a mission. There are numerous examples that showcase the system’s potential as well, demonstrating that it can transcend Tarantino and moving into sf and fantasy (Highlander and Terminator are given as examples). This system would be equally at home running Inception, The Magnificent Seven, or Saving Private Ryan. This is probably the best money I’ve spent on gaming this year–all $12 of it for the pdf.